Screengrab via Tinder Guys With Tigers on Instagram. 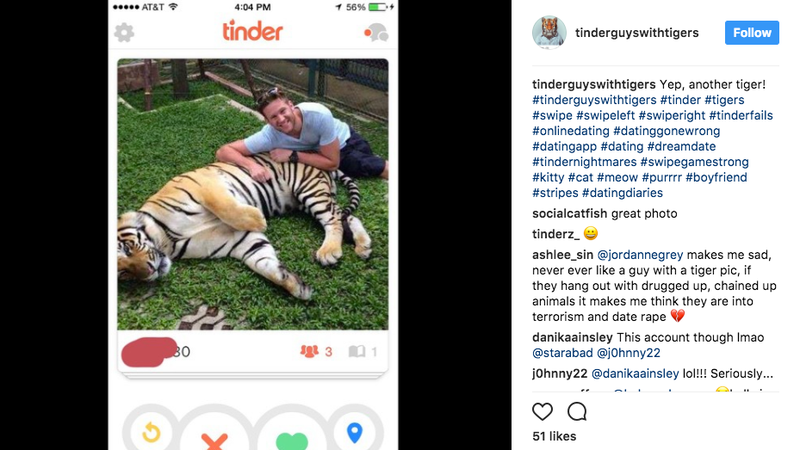 Today is International Tiger Day, and to celebrate, PETA would like to stop people from sitting on/high-fiving/cuddling/bottle feeding/trolling/chilling with tigers for their Tinder profiles. Tigers everywhere are pleased. What might, at first swipe, look like a harmless picture actually means that someone was caged, dominated, and tied down or drugged before their photo was taken and uploaded online. Not to bash men, women also pose obnoxiously with tigers.